December 13, 2001. 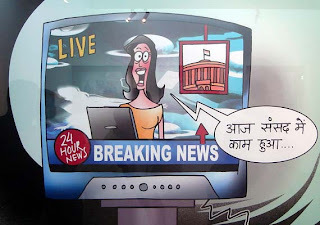 The Indian Parliament is attacked. A dozen dead, including the attackers. Massive deployment of soldiers by India to the border with Pakistan. Relations strained. Many arrests made. Some convicted, others acquitted. One now in death row, seeking clemency. In five years, a lot has been happening, moving and changing. 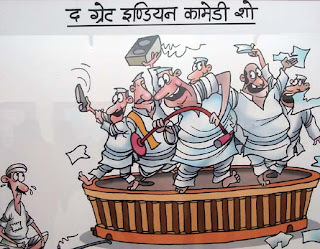 But inside the highest seat of the world's largest democracy, not much has changed except for the people occupying the treasury and the opposition benches. 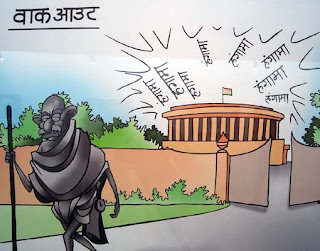 They termed the December 13 attack as one on Indian democracy. I wouldn't reproduce on this blog what actually were the people's reactions (there's a strong possibility of getting blocked). Everyone knows, or can very easily guess how the common man would have reacted. The most crippling attack on the form of government that this country practices is not from the terrorists or militants from outside, rather it is from the ones inside the House. Every session is an unending assault. 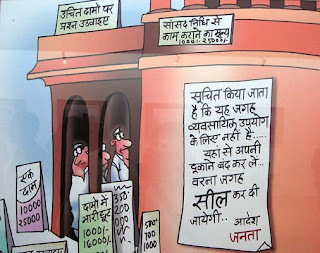 This is what cartoonist Neeraj Gupta says through his exhibition 'Sansad Par Hamla' (Attack on Parliament). The exhibition was inaugurated yesterday, by veteran cartoonist Sudhir Tailang at the All India Fine Arts and Crafts Society, 1 Rafi Marg (Opposite Rail Bhavan), New Delhi 110001. The exhibition is on till Sunday, December 17, 2006 from 1:00 PM to 7:00 PM. 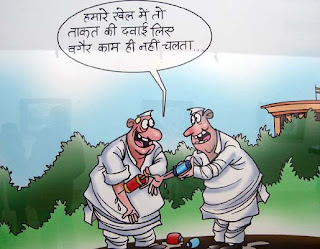 I know Neeraj (Neerajsir to me) since my university days in Bhopal, where he was a cartoonist with Nava Bharat. He was someone who fitted my visualisation of a cartoonist to the hilt. The other two that I met in flesh and blood were quite different. 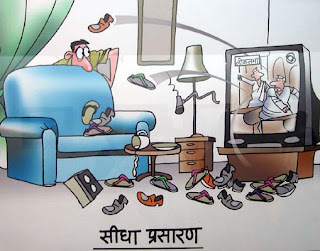 The great RK Laxman came across as acerbic (maybe because of his age), but not without wit and I didn't believe that Sudhir Tailang was Sudhir Tailang until he drew a caricature of the then Prime Minister Atal Bihari Vajpayee on my notebook (but Narasimha Rao remains his best), he to me looked quite un-cartoonist like. Neeraj is jovial man even in the most adverse of circumstances. Someone, who isn't afraid to take risks and face challenges, even if the costs involved are great. One fine day he gave his comfortable job up and landed in the city of dreams, Bombay, in pursuit of his dreams (later also took me along on my very first visit to the city and played a gracious host). 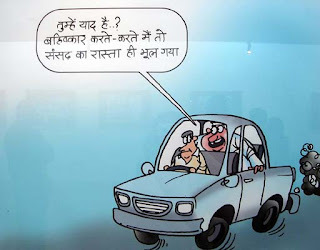 When things didn't work out the way he would have liked them to be, he bid adieu to Bombay and landed in Delhi in his tried and tested vocation as a cartoonist with Dainik Jagran. Not very satisfied with the ways of the media, he joined Samsung India Electronics, where he is the Creative Director. If you happen to visit the exhibition, do chat with him He's interesting to talk to. Makes you feel comfortable. 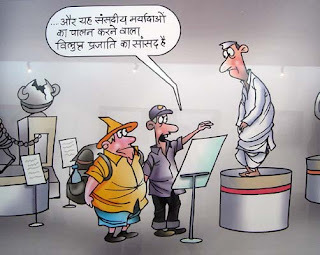 Here are a few cartoons from the exhibition (tried to translate them for readers who are not comfortable with Hindi, but much might be lost in the process). BTW your blog is taking a lot of time to load, is it only me ? Maybe just check it with others too. 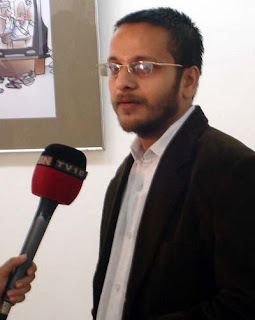 Arre bhaimian, I was looking for something related to parliament attack (http://www.outlookindia.com/full.asp?fodname=20061218&fname=Arundhuti+%28F%29&sid=1) when I bumped into your fantastic blog. How do you add links now? Don't worry would find out soon and would blogroll you. Great post, written about bhopal lately? Sandeepa I was honoured. With so many photos and videos it has become a sloth. Need to lighten the place up. Bhopal-e Badiya! I've mailed you my writings on the City of Lakes.